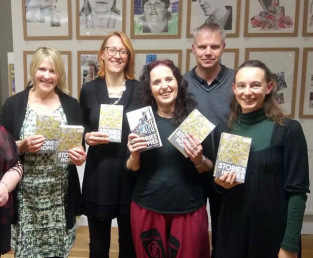 On Saturday night I took part in a fantastic event supported by the Folkestone Book Festival: the paperback launch of the second volume of Stories For Homes, an anthology of 55 short stories, poems and flash fictions on the inexhaustible theme of ‘home’, in aid of UK housing and homelessness charity Shelter. It’s an undeniably grim picture, but everyone who supports Stories for Homes through purchases and donations is helping to keep Shelter’s services and guidance available to people in acutely difficult and dangerous situations and to keep the issue visible on the political agenda. That is why Debi and co-editor Sally Swingewood decided to do it all again and their hope to build on the success of SFH Volume One was realised right from the start when over 250 submissions were received. Everybody involved has donated their work and their time – in many cases, a lot of time. Apart from donating a story, my involvement to date has been fairly minimal, so this is the moment for me to step up and make a noise about a bloody good book. In 2017 only a handful of books have touched me deeply – as opposed to just being a cracking story with great characters and beautiful writing. (Of course, there is no ‘just’ about it – those things are very hard to do). But the new Stories for Homes Volume 2 is one of them. It kept on doing it! In fact, it’s one of the finest short story anthologies I’ve come across, in its consistent quality and exceptional variety of theme, setting and tone. Debi and Sally faced a huge task selecting the stories in the first place (another 29 have appeared in the Online Anthology) and compiling them to achieve this balance of tender, hilarious, heart-breaking, shocking, surprising, enraging. The characters live. There are so many I loved that I’m not going to single any out. One thing which struck me whilst reading it, and again at Saturday’s event, where the audience listened to Rose McGinty, Michele Sheldon, Mike Blakemore, Rachael McGill and me, was the thread of humanity and relatability which runs through these stories. And it’s noticeable that many of the most powerful and insightful pieces are by authors crossing all kinds of boundaries of identity and experience, with conviction and sensitivity. It’s a controversial subject but I don’t accept that anyone has the right to tell others what they can and can’t write about. With that mindset I couldn’t have produced any of my published work, including the story A Place to Paint Yellow in this book (and yes, you’re going to have to read it to find out why). After my reading, I talked about the way fiction engenders empathy and compassion, both in the reading and the writing, and why it’s so important to be able to step beyond ourselves, to imagine and care how it might feel to be someone else. There’s currently a lot of doom-mongering about the state of the world and this country – understandably – but defeatist thinking isn’t what leads to positive action. People who collaborate to make a small difference are often individuals who wanted to ‘do something’ rather than do nothing on their own, or look the other way because the problems just seem too huge. At Saturday’s launch we had a great crowd, sold a lot of books and raised a lot of money, but there was something else happening: the sense that good things are possible. Please buy the book if you can – I’m confident you’ll enjoy it (and so will all the friends and relatives you decide to give it to for Christmas). If you hadn’t guessed, Stories for Homes Volume 2 is one of my Books of 2017 – to find out what else impressed me, click here! 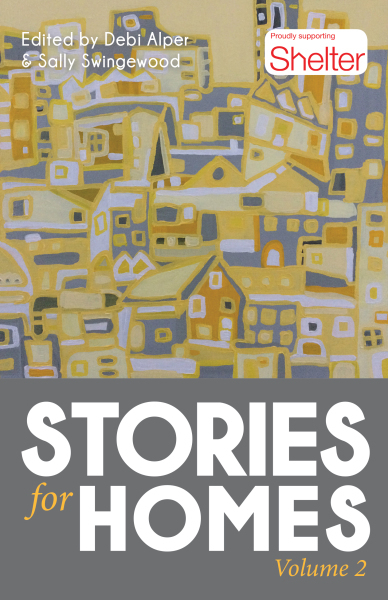 Thanks to our Folkestone audience, to Michele Sheldon for organising the event, and to everyone who’s given invaluable support to Stories for Homes Volume Two. Pictured L to R: Michele Sheldon, me, Debi Alper, Mike Blakemore, Rachael McGill. Something completely different to the usual next week: Isabel Losada will be joining me to talk about her non-fiction book Sensation and her above and beyond research into female sexual pleasure – and unless I lose my nerve, I will be following with a (very) personal response to the issues raised by the book, which are central to my own fiction. Thanks so much, Voula – that is typically lovely of you! I bought it on my Kindle! Looking forward to tucking in to all the stories. Hope you enjoy, Louise! It’s fantastic that the project has the support of so many of our writer friends.